Yup, that’s no auto-correct gone wild. 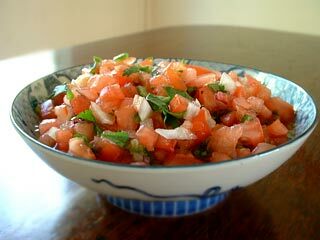 I make this crab salsa as an appetizer. I slice a baguette into quarter inch slices and toast it just a little and then top them with this crab salsa and serve with a Duck Walk white wine… seems I often have a good supply of white wine around here…. simply combine all these in a mixing bowl. Now, here’s a good handy hint… roll the lime on a good hard cutting board before extracting the juice, and you’ll get more juice out of the lime. Top the toasts and serve it up. Mix all of these in a bowl. Then I transfer them to a large bell jar and let it sit a couple of hours to meld. 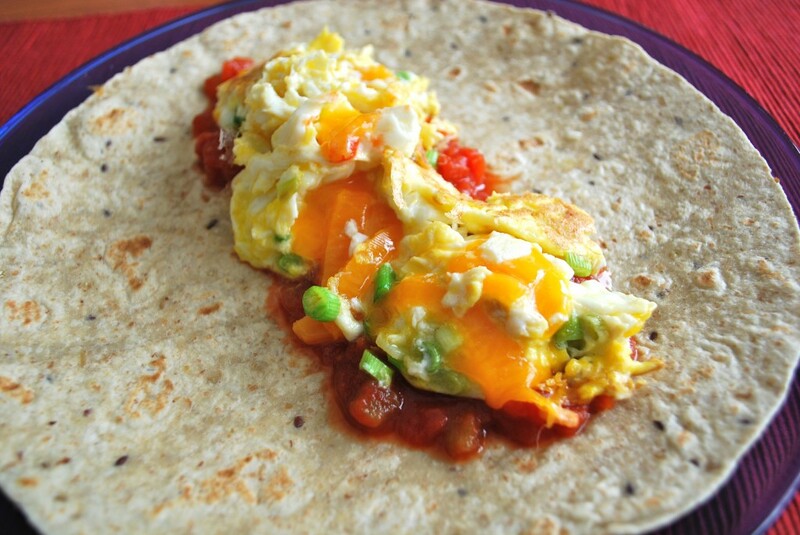 Then, pop the top and grab the chips… or, as in today’s dish, spoon it onto the scrambled eggs in the tortilla… wrap it up and go out and play! I know its January, and the winter is well set in. So why does H-Mart have a big sale on mangos and papayas? 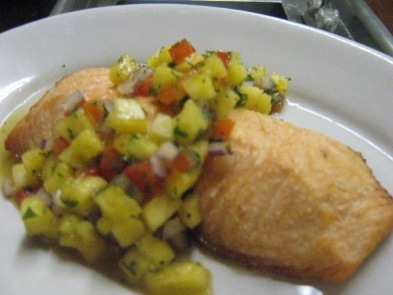 It is a mystery to me, but an inspiration also… blue fish with a Caribbean mango salsa. It’s an explosion of flavors that will convince you that winter is actually far far away. Combine all these ingredients in a large mixing bowl. Let it sit in the fridge for an hour or so it let the flavors meld together. 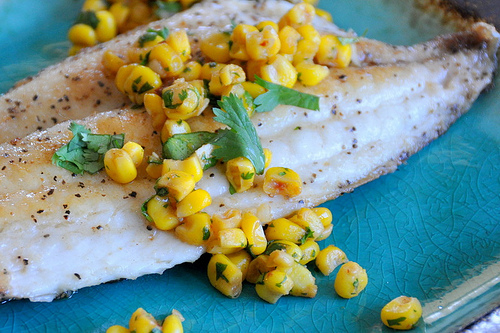 Now, grab a pair of bluefish fillets and place them in a baking dish. Spread the salsa on the fillets and bake in a 350 degree oven for about half an hour. 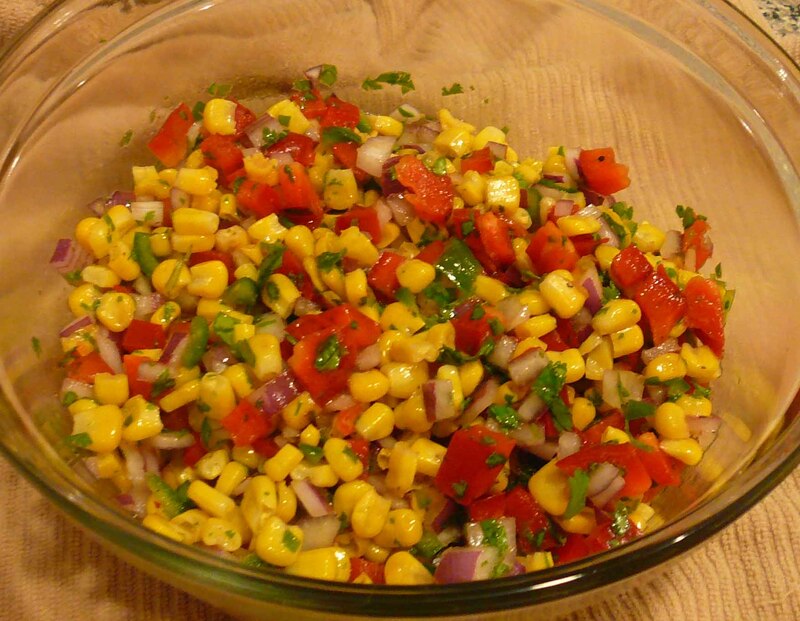 So, it seems like we are doing a salsa week so lets build on the basic tomato salsa from a day or two ago and lets use up that cilantro and those odd ears of corn left over at the bottom of the fridge (AKA the forgotten zone). What to do with dried ears of corn? Well, we re-hydrate, the same technique we use on the ancho chile. Salsa is on the way. Step one, re-hydrating. I cut up the ancho chilies, which are simply dried pablano peppers, and remove the dried corn kernel from two ears of corn. I put these in a microwaveable container with a little water and I like a dash or two of hot sauce (caution – depending on the sauce you use here it can make a big impact on the heat factor of the final salsa… lets be careful out there). Nuke this for a minute or two. 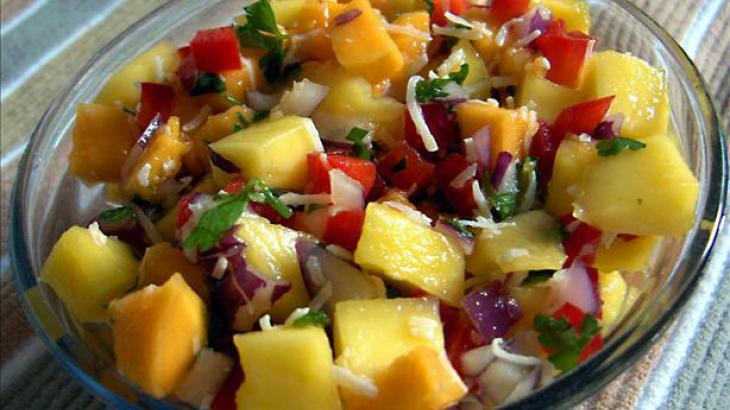 Transfer this mixture to a large bowl and add the diced tomatoes and onions. combine thoroughly and let rest to meld the flavors. Then, serve with your favorite chips. Did I mention that there was a big sale on lime at Western Beef last week? Oh, I probably did. Well, while I was there I also picked up a bunch of tomatillos. These are the green Mexican tomato cousins that form the base of a salsa verde. 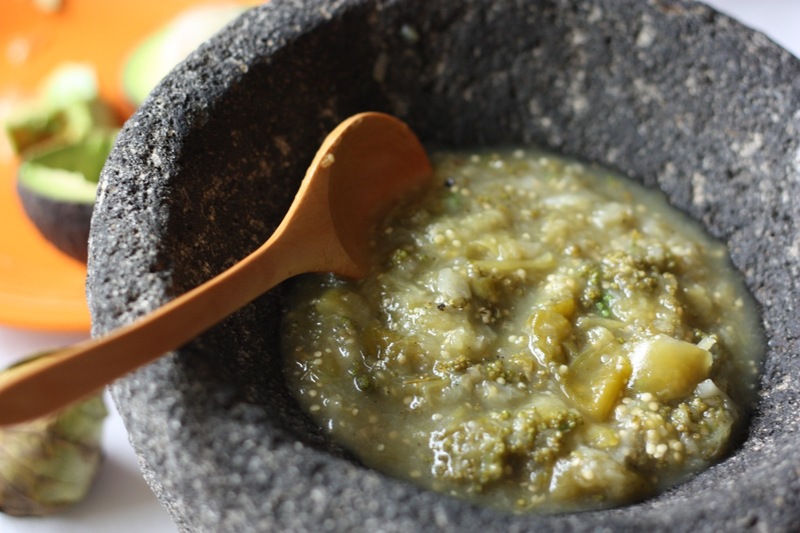 Unlike tomato based salsas, these tomatillos need to be cooked before becoming salsa. To cook the tomatillos, you can either roast them in the oven, or boil them. Roasting will deliver more flavor; boiling may be faster and use less energy. Either way works, though boiling is a more common way to cook the tomatillos. Place tomatillos, lime juice, onions, cilantro, chili peppers, salt in a food processor if you have one, I use a basic blender, and pulse until all ingredients are finely chopped and mixed. Cool in refrigerator.